I have a confession to make. My name is Samantha Martin and I get a little bit obsessive about my tanning routine. Not just when I’m going on holiday or when I’m faking it, but all year round. Amongst people I know, including beauty therapists, I’ve become the go-to person for tanning advice. I know exactly how to get from milk bottle white to perfectly golden in record timing. Which products to use, and safely. I can go from winter white on Thursday to looking like I’ve had a fortnight in Barbados by Saturday. So when the lovely folks at Ideal World Shopping Channel heard that I was off for an actual real life fortnight in Barbados they knew I’d be perfect for trying out their tan accelerator, Zhuzh. As you can see from the photos I’m blonde (natural) so that means I’m also naturally quite fair skinned. A few years ago I had an allergic reaction to a tanning product which gave me patches of odd pigmentation. It’s mostly on my legs, so now I find that the best way of covering that up is by tanning (oddly enough). I would say I have literally tried every product there is. I know what works, what looks natural and what lasts without streaks in the fake range. And I know exactly which products to use when I go away to ensure I get a great, long-lasting tan. Without damaging my skin or burning. Because I’ve also done my cosmetics licensing in the past to be able to make products I’m very aware of what goes into everything. And all the nasty chemicals to avoid. Steve Whatley’s Zhuzh Tan Accelerator from Ideal World is a Shea Butter based product, therefore it won’t leave you greasy but will give your skin that much needed extra moisturising it needs when exposed to the sun. What you do have to remember is that it is not an SPF so you have to but your Zhuzh on first and then your SPF. The product itself comes in a pump spray bottle so it’s easy enough to apply, just spray and rub. Ideal World sent me both sizes of the product in 100ml, which is handy if you are just going on a quick trip and only taking hand baggage is this size is ok to take on the plane. And they also sent me a full-size 200ml version. I did find that even though I reapplied the product quite a few times throughout the day, I didn’t use that much of it and I’ve still plenty left. So, if like me you go away a few times a year, buying the twin pack of these at £19.99 would last you quite a while. Ideal World also sent me some of the Zhuzh individually wrapped tan accelerator towels. I did find these handy to use on the beach or just on the go but personally, I preferred using the spray product and the 100ml is small enough just to pop in your beach bag anyway. The towels are probably handy for using on sunbeds (safely). I still have one left so I might give it a go soon and let you know how I get on. Saturday – top to toe exfoliate and hair removal. Make sure there is no dead skin hanging around and pop a drop of moisturiser on your elbows, knees and ankles. I would usually do this in the morning and then you can check over to make sure you’ve no flaky skin before bed. At bedtime, it’s time to apply your fake tan. I use the St Tropez Mouse which I find gives an amazing colour and goes on perfect every time. If you have darker skin or are already a bit tanned then you can use the dark version of the mouse. But it is dark, so be warned. I use a mitt to apply and don’t over rub. Let it soak into your skin naturally before popping on your pj’s and off to bed. Sunday morning – get in the shower quick before you scare the rest of the household with your top colour. Rinse off the top coat colour so you are left with your golden self-underneath. I then use the St Tropez in shower cream which I’ve found is great for preserving your tan. Once you are out of the shower then moisturise with the St Tropez gradual tan. Zhuzh also have their own range of self-tanning products but I haven’t tried these as yet. But as soon as I do I’ll let you know the results. You should at this point be nicely golden and bikini ready and no need to hammer the sunbathing in a bid to get a tan quickly. However, if you don’t feel bronzed enough and think you need to be a bit darker before you don your bikini in public, then on Sunday afternoon you could always do an hour or two with the St Tropez Express Mouse. But at this point, you should go sparingly with it and don’t keep it on for too long or you’ll go dirty looking rather than bronzed. And then it’s time to jet off! One of the biggest mistakes people make when they tan is not making sure they moisturise like crazy. Zhuzh is great for this as the shea butter is a great natural moisturising ingredient. And it’s a bonus that it also helps boosts your tan too. Once I’d applied the Zhuzh I then used an SPF30 with added insect repellent. The Shea Butter will attract the bugs so make sure you use a good repellent. I always get eaten alive by bugs in Barbados. I also use an extra layer of a local product called Go. If you go in the pool or sea or get very sweaty you will need to apply more Zhuzh as it’s not water resistant. And make sure you keep reapplying your sun cream too. As I went to Barbados in what’s still classed as rainy season you get a shower or two a day. I find this breaks up my tanning day if I’m having a pool or beach day. And it ensures that I don’t spend all day laid out in the sun, which isn’t very good for your skin. After you’ve finished sunbathing, shower using something moisturising but not overly perfumed (perfume attracts bugs) and then apply a thick layer of moisturisers, preferably something containing aloe vera. Zhuzh also have an after-tan aloe vera product but I haven’t tried that as yet. I mainly use the St Tropez gradual tan moisturiser as that is aloe vera based. It helps cool your skin and maintain your tan. As you can see from the photos I’ve included I did go very dark. 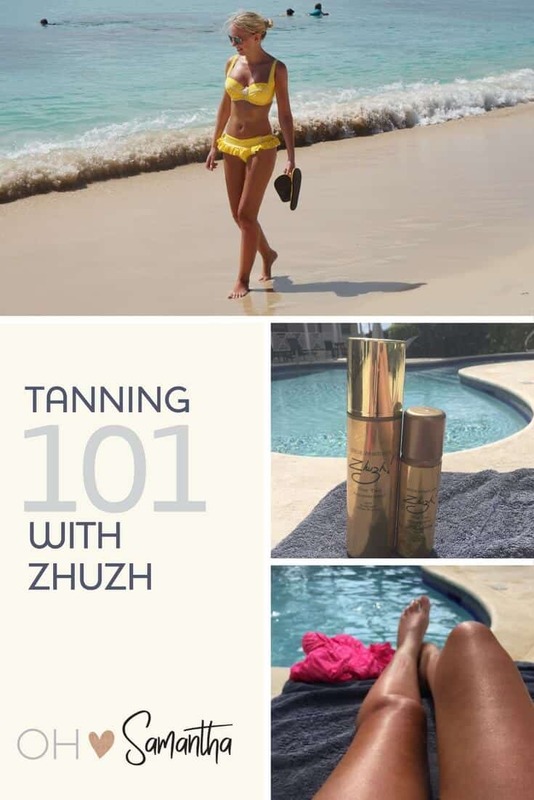 I was impressed with the results from using Zhuzh as part of my tanning routine and I will certainly be using it again. I’ve also found that since I’ve been home my tan has lasted. I can still see visible lines from where my bikini was. Not that I’ll be flashing my tan lines around much now we are into winter and it’s blooming freezing out. At least I still have some tan left to remind me of my lazy sun-soaked holiday in beautiful Barbados. Ideal World and Zhuzh did not pay me for this review but they did give me free products to try. This review is based on my own personal opinion from trying their products.